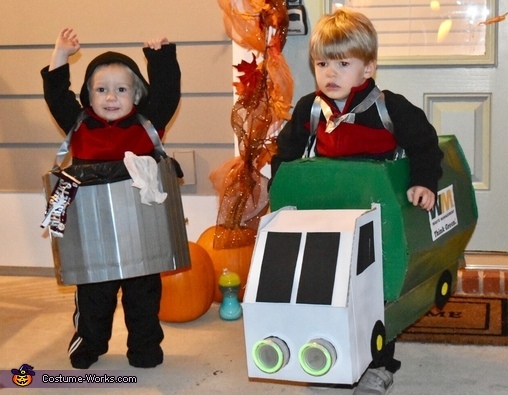 My son is 3 and is obsessed with garbage trucks so I made him a garbage truck costume and my 27 month old s garbage can. I made the garbage truck from 2 cardboard boxes and duct tape. It took me 8 hours but was well worth it. I made him a little bucket out of cardboard that I attached the straps to that went around his shoulders to hold up the garbage truck. To make the hopper inusedcs king cardboard box and folded it multiple times to give it that octagon shape. I cut a hole out of the top for his candy so he wouldnt have to hold a basket. The headlights are made from corn cans. The wheels from felt. He wore it all night! The garbage can is made out of cardboard as well and duct tape. I duct taped trash to it and a trash bag. He wore it all night as well!